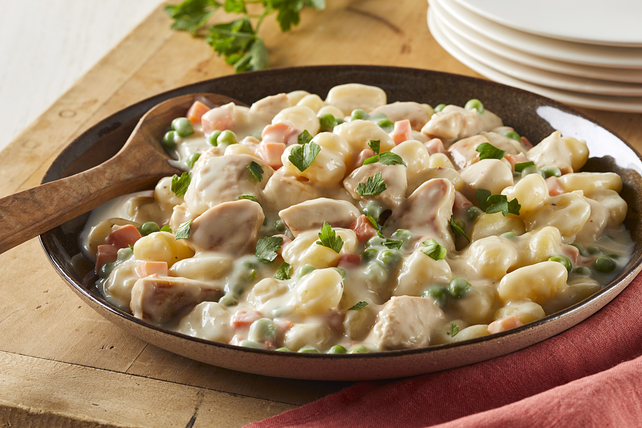 Try our Skillet Chicken & Italian Dumplings for a tasty weeknight option. In only 40 minutes you'll have a flavourful dish with gnocchi, or Italian dumplings, chicken, peas and carrots. Heat 2 Tbsp. dressing in large skillet on medium heat. Add chicken; cook and stir 4 min. or until lightly browned. (Chicken will not be done.) Spoon chicken into bowl; set aside. Add broth gradually to flour in small bowl, whisking constantly until well blended. Add 1 Tbsp. of the remaining dressing to skillet. Add garlic; cook and stir 2 to 3 min. or until fragrant. Add flour mixture; cook and stir 2 min. or until thickened. Add cream cheese; cook and stir 3 min. or until cream cheese is completely melted and sauce is well blended. Add chicken, vegetables, gnocchi and remaining dressing; mix lightly. Bring to boil, stirring frequently. Cook on medium-low heat 15 min. or until chicken is done and gnocchi are tender, stirring frequently. Remove from heat. Sprinkle with parsley.